Prozax, s.r.o. was formed in 1995 within the privatization of the prototyping machine manufacture operations founded in 1965 for the needs of the Barum Company (former Rudý říjen). Our main activity is the development and production of single-purpose machines and equipment. 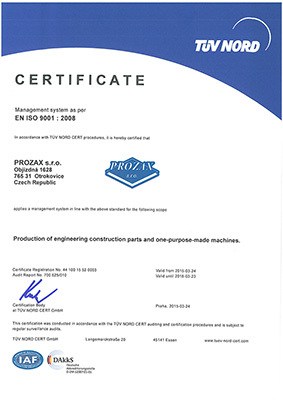 After privatization, we maintained the manufacturing program and have extended it, e.g., to low-voltage switchgear production, goods handling equipment as well as the manufacture of spare parts for machines that were not manufactured by PROZAX. The greatest advantage we can offer is our flexibility, reflected in the continuous expansion of our activities. Thus we are able to satisfy customers who require the production of machines or other machinery, including the processing of technical documentation. Our primary goal is to satisfy our customers' needs and to provide them with a complete solution. For many years now, we have been providing machines and other equipment as well as installation for our customers. Based on agreement we can also provide post-warranty maintenance of the equipment. Continental Barum Otrokovice and Continental Hannover have for many years been our biggest customers. These, our two biggest customers, require top quality, reliability, and accuracy of deliveries from their suppliers. When manufacturing our machines, we place great emphasis on as low a failure rate as possible during continuous operation or in difficult working conditions. In the manufacture of our machines we use materials and components from suppliers that ensure a high degree of quality (Siemens, Festo, Sick, Sew, and many others). Following the continuous development of activities since 2003, our company owns 50% of our subsidiary company, FANAM s.r.o., based in Napajedla. 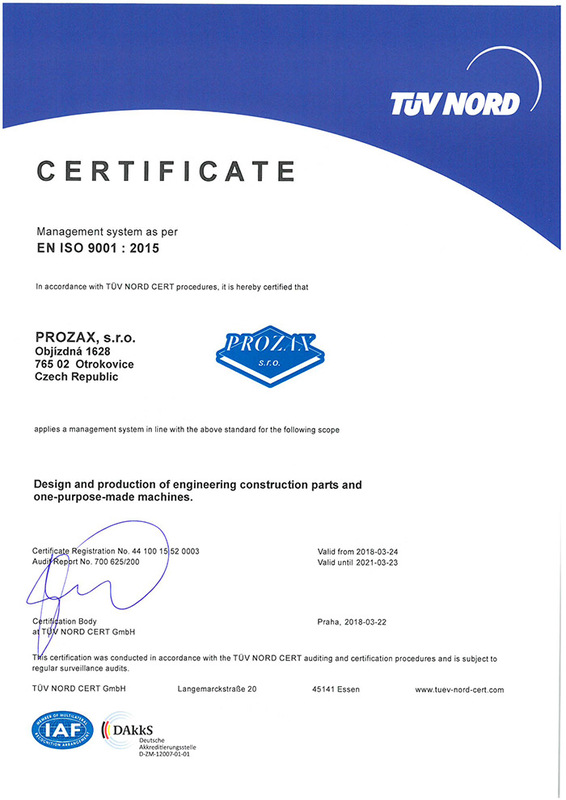 Our reliability and quality is guaranteed by the ISO 9001:2009 certification that we obtained in 2001.